Since the last update (a couple of months ago) I added the green leafy branch. I think I used about six different shades of green but it doesn't really show as much as I hoped to... The small white flowers are also new additions. Not much shading in those though. To make the background more interesting/varied I'm adding grey clouds to the piece. I'm using white and three shades of grey for those. While stitching the cloudy background I'm always reminded of this Kate Bush classic called Cloudbusting. It's from her fab Hounds of Love album which is very dreamy and lovely. Anyway, have you tried shading yet? I'm thinking of making a tutorial on how I'm 'Cloudbusting' (by which I mean: making shaded embroidered clouds) if anyone is interested. This is very accomplished Nicole! If you like Kate Bush she is rumoured to be playing the Closing Ceremony at the Olympics - I hope so. Especially if she does Wuthering Heights! 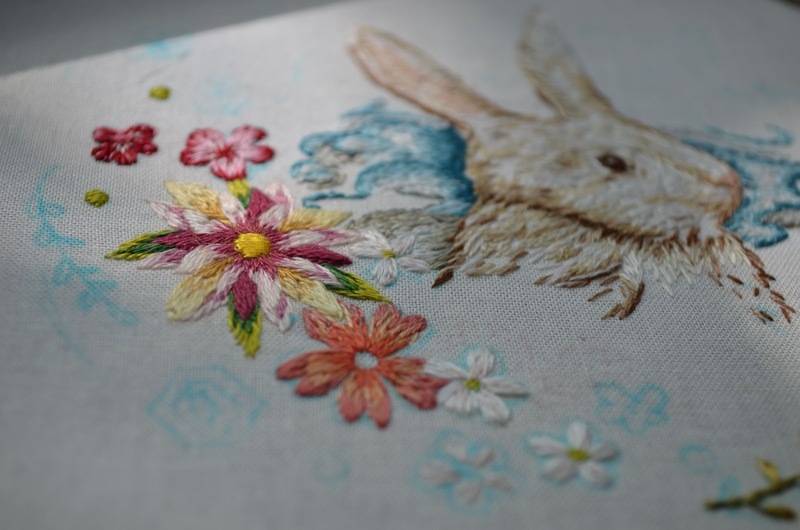 Stunning stitching. I love the rabbit. 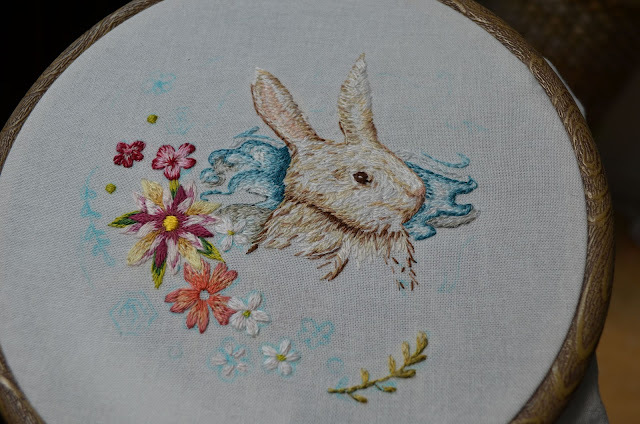 Your bunny is turning out absolutely wonderful! Really inspiring! Beautiful! The clouds are stunning! This is just gorgeous Nicole! I wish I could embroider as well as you! It's coming along beautifully. I love to look at your work. It never fails to make me happy. I'd be quite interested in that shading tutorial!